Spotted dolphins include two tropical species with widely varying habitats, external appearance, and habits. However, it is likely that there will be further revision of their taxonomy as more becomes known. 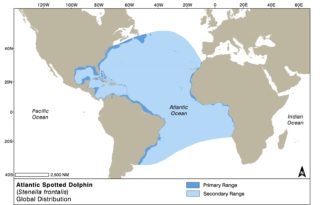 Currently, the Pantropical spotted dolphin (Stenella attenuata), is found in the Pacific, Atlantic and Indian Oceans, as well as the Persian Gulf and Red Sea; and the Atlantic Spotted dolphin (Stenella frontalis), is limited warm-water regions of the Atlantic. 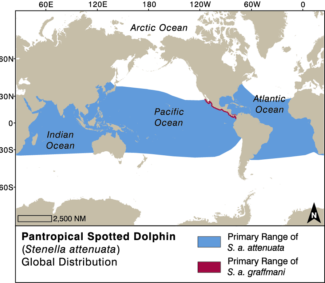 Pantropical spotted dolphins are further divided into two recognized subspecies, the offshore spotted dolphin (S.a. attenuata), which has a global distribution, and the Coastal spotted dolphin (S.a. graffmani)1, which is only found along the Pacific coast of Mexico and Central America. To further complicate matters, these dolphins are closely related to, and sometimes difficult to distinguish from many of the species with which they share their range and often form large mixed species groups. Pantropical spotted dolphins are best known for their longstanding association with the tuna fishing industry in the Eastern Tropical Pacific, which caused significant population declines in the past. Atlantic Spotted dolphin in the Canary Islands. Photo courtesy of Fabian Ritter, MEER. 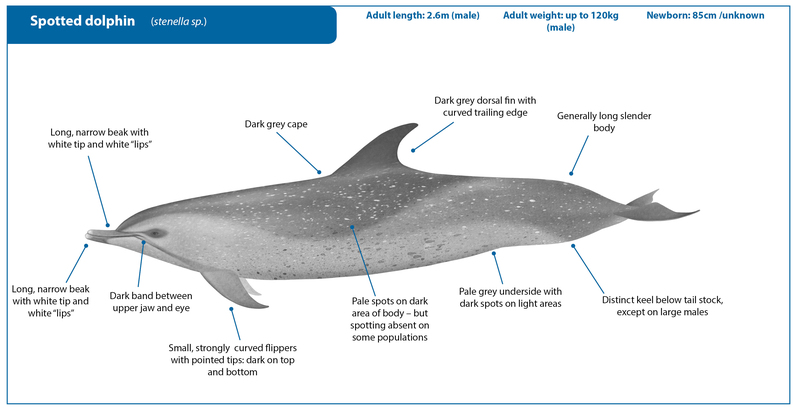 Note that Atlantic spotted dolphins are generally shorter but more robust than pantropical dolphins – with a chunkier body and thicker beak (see some of the photos below). Their colour pattern progresses over time from un-spotted to spotted . Spotted dolphins have ranges that overlap in the tropics with a few different species that have similar characteristics, and they can be very challenging to distinguish at sea. Pantropical spotted dolphins often overlap in range with spinner dolphins, which have a more slender hooked dorsal fin, longer slimmer beak, and (usually) a clear three-banded or tripartite colour pattern. Atlantic spotted dolphins, when fully grown have more pervasive spotting than pantropical dolphins, a shorter, stouter beak and more rounded head, and longer, less sharply curved flippers. Atlantic spotted dolphins are more robust than their pantropical cousins, and do not develop spotting until later in life. 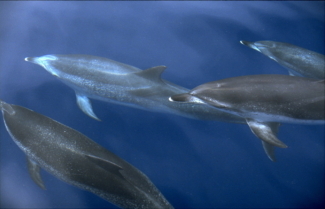 As a consequence, unspotted juveniles and sub-adults can easily be confused with smaller forms of bottlenose dolphins where both species occur. While bottlenose dolphins tend to be larger and more robust than spotted dolphins, a trained eye may be required to distinguish them at sea. Pantropical spotted dolphins (Stenella attenuata) are found in the Pacific, Altantic and Indian Oceans, as well as the Persian Gulf and Red Sea. They are generally limited to latitudes between 40°S and 40°N. They are mostly found in deep offshore waters, although they can be observed around oceanic islands or other coastlines where there is deep water near to the coast (such as Central America and Mexico, the Hawaiian Islands, Tawian and the Philippines)2-4. The Atlantic Spotted dolphin (Stenella frontalis) is limited to warm-water regions of the Atlantic. Both species are absent in the Mediterranean Sea.3,5,6. In the Bahamas a population of Atlantic spotted dolphins unusually spends a lot of time over sand flats in water only 6-12 m deep, rendering them more available for detailed study than most other spotted dolphins6. Atlantic spotted dolphins are native to: Angola; Antigua and Barbuda; Bahamas; Barbados; Belize; Benin; Bonaire, Sint Eustatius and Saba (Saba, Sint Eustatius); Brazil; Cape Verde; Cayman Islands; Colombia; Costa Rica; Côte d'Ivoire; Cuba; Curaçao; Dominica; Dominican Republic; Equatorial Guinea; French Guiana; Gabon; Gambia; Ghana; Guinea; Haiti; Honduras; Jamaica; Martinique; Mauritania; Mexico; Montserrat; Nicaragua; Panama; Portugal (Azores, Madeira); Puerto Rico; Saint Helena, Ascension and Tristan da Cunha; Saint Lucia; Saint Martin (French part); Saint Vincent and the Grenadines; Senegal; Sierra Leone; Sint Maarten (Dutch part); Spain(Canary Islands); Togo; United States; Venezuela, Bolivarian Republic of; Virgin Islands, British; Virgin Islands, U.S.
Pantropical spotted dolphins in the Indian Ocean. Photo courtesy Chris Johnson. Pantropical spotted dolphins feed on small schooling fish, and sometimes squid or crustaceans that live in the deep scattering layer – a dense layer of small marine animals of many different species that descends during the day and rises toward the surface at dusk to feed on plankton7. This diet brings pantropical dolphins into frequent association with various species of tuna, as well as spinner dolphins and other oceanic predators that feed on the same prey3,8. 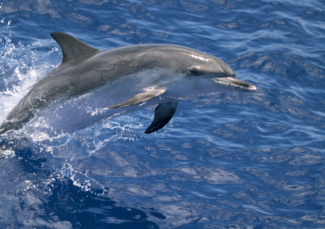 Atlantic spotted dolphins have similar diets in their open ocean habitats, but may feed on a wider variety of bottom-dwelling fish and invertebrates when closer to shore.5 Atlantic spotted dolphins are also known to form large mixed species groups with common dolphins, bottlenose and striped dolphins in response to prey availability9. Different poupaltions of spotted dolphins around the world appear to have evolved different social structures and habits. Nearshore Atlantic bottlenose dolphins in the Bahamas comprise one of the best studied poulations of the species group with long-term studies completed on their social structure and communication 10,11. Yet, little is known about Atlantic spotted dolphins’ life history: Females are thought to give birth an average of once every 3 years, and nursing is thought to last up to five years5. Much more is known about the life history of pantropical spotted dolphins, due to the high number of dead dolphins that have been examined by scientific observers in the Eastern Tropical Pacific (ETP) tuna fishery12. Gestation is 11.2-11.5 months, and females have calves every 2-3 years. Calves are normally weaned at 9 months but can continue nursing for up to 2 years3. Atlantic spotted dolphin. Photo courtesy of Chris Johnson. Atlantic spotted dolphin mother and calf in the Canary Islands. Photo courtesy of Fabian Ritter, MEER. Predators of both species of spotted dolphin include killer whales and sharks. Pygmy killer whales, false killer whales, and short-finned pilot whales are also possible predators3,5. Despite the heavy rates of mortality suffered by pantropical spotted dolphins in the 1960‘s and 70’s, the species is thought to be one of the most numerous dolphins in open ocean habitats throughout the tropics. It is designated as Least Concern by the IUCN Red List of Threatened species, and is on Appendix II of the Convention on Migratory Species (CMS). Atlantic spotted dolphins have not been studied in enough detail to generate population estimates throughout most parts of their range, and are designated as Data Deficient on the IUCN Red List. They are not listed on either appendices of the CMS. 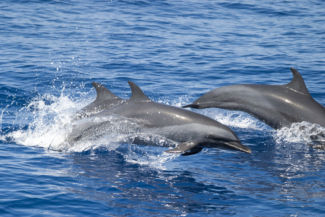 Atlantic spotted dolphins in the Canary Islands. Photo courtesy of Fabian Ritter, MEER. Pantropical spotted dolphin off the coast of Colombia. Photo courtesy of Erika Ortiz - Fundación Omacha. 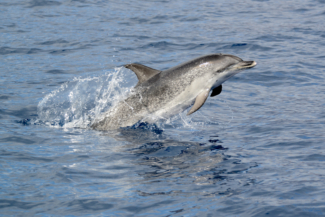 There are few places in the world where spotted dolphins are the primary target of dolphin watching activities, but they are often observed off the coasts of central and south American countries like Peru, Panama, Costa Rica and Colombia, and are frequently spotted in the Canary Islands16 (Spain) and the Azores (Portugal). Resident populatinos in the Caribbean have been the focus of long-term studies on communication and dolphin associations11,17. 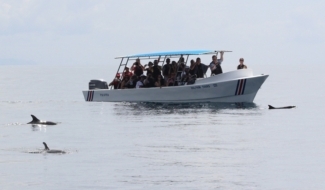 Whale watching vessel with pantropical spotted dolphins in Costa Rica. Photo courtesy of Fundacion Keto. Hammond, P. S. et al. in The IUCN Red List of Threatened Species. Version 2014.3 (http://www.iucnredlist.org/det... Consulted October 2017, 2012). Perrin, W. in Encyclopedia of Marine Mammals (eds W. Perrin, B. Wursig, & J.G.M. Thewissen) 819-821 (Elsevier, 2009). Perrin, W. in Encyclopedia of Marine Mammals (eds W. Perrin, B. Wursig, & J.G.M. Thewissen) 55-56 (Elsevier, 2009). Hammond, P. S. et al. in The IUCN Red List of Threatened Species (http://www.iucnredlist.org/det... Consulted October 2017, 2012). Wang, M.-C., Walker, W. A., Shao, K.-T. & Chou, L.-S. Feeding habits of the pantropical spotted dolphin, Stenella attenuata, off the eastern coast of Taiwan. Zoological Studies 42, 368-378 (2003). Perrin, W. F. in Encyclopedia of Marine Mammals. Second Edition (eds W. F. Perrin, B. Würsig, & J.G.M. Thewissen) 1100-1103 (Academic Press, 2009). Green, M. L., Herzing, D. L. & Baldwin, J. D. Noninvasive methodology for the sampling and extraction of DNA from free-ranging Atlantic spotted dolphins (Stenella frontalis). Molecular Ecology Notes 7, 1287-1292 (2007). Welshe, L. S. & Herzing, D. L. Preferential association among kin exhibited in a population of Atlantic Spotted Dolphins (Stenella frontalis). International Journal of Comparative Psychology 21, 1-11 (2008). Archer, F., Gerrodette, T., Chivers, S. & Jackson, A. Annual estimates of the unobserved incidental kill of pantropical spotted dolphin (Stenella attenuata attenuata) calves in the tuna purse-seine fishery of the eastern tropical Pacific. Fishery Bulletin 102, 233-244 (2004). Wade, P. Revised estimates of incidental kill of dolphins (Delphinidae) by the purse-seine tuna fishery in the eastern tropical Pacific, 1959-1972. Oceanographic Literature Review 1, 69 (1996). Gerrodette, T. & Forcada, J. Non-recovery of two spotted and spinner dolphin populations in the eastern tropical Pacific Ocean. Marine Ecology Progress Series 291, 1–21 (2005). Edwards, E. F. Fishery Effects on Dolphins Targeted by Tuna Purse-seiners in the Eastern Tropical Pacific Ocean. International Journal of Comparative Psychology 20, 217-227 (2007). Ritter, F. Boat-related behaviours of cetaceans as a tool for the development of species-specific whale watching guidelines. (MEER (Mammals Encounters Education Research) eV, Berlin, Germany, Poster presented at the Annual Conference of the ECS, Gran Canaria, Spain, March 2003, 2003). Herzing, D. L. Clicks, whistles and pulses: Passive and active signal use in dolphin communication. Acta Astronautica 105, 534-537.